In a verdict having a far reaching import for the political fraternity, the Supreme Court today ruled that prior sanction was not required for the prosecution of public servants, including chief ministers and ministers in corruption cases. 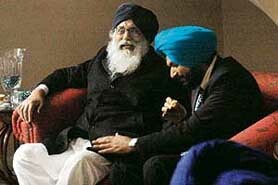 Parkash Singh Badal for allegedly amassing assets worth about Rs 3,500 crore. Lalu Yadav and his wife Rabri for their alleged involvement in the fodder scam case. Former BJP MP from Amritsar and ex-Indian cricketer Navjot Singh Sidhu was today sentenced to three years’ rigorous imprisonment and was also ordered to pay a fine of Rs 1 lakh by the Punjab and Haryana High Court. I am not looking for any sympathy as that is for the weak. I am not a weak man. What type of justice is this? We will go to SC. It is a virtual double jeopardy for the SAD-BJP alliance in Punjab. Today’s two judgments—one by the Supreme Court and other by the Punjab and Haryana High Court— will certainly throw all poll calculations of the combine to the winds. Unruffled by the verdicts of the Supreme Court and the Punjab and Haryana High Court, the SAD will go ahead with an unprecedented birthday bash of its supremo Parkash Singh Badal at Moga on Friday. A Delhi court today framed charges against Punjab IGP Sumedh Singh Saini and three others in a case pertaining to the “disappearance” of two Ludhiana businessmen and their driver from “illegal” detention 12 years ago. When Prime Minister Manmohan Singh holds talks with his Japanese counterpart Shinzo Abe in Tokyo on December 15, his agenda will be shaped by two important evolving developments: the nuclear deal with the USA and the United Nations General Assembly taking up a debate on reform and expansion of the Security Council. The Congress-led UPA government’s move to reserve 27 per cent seats for OBCs in institutes of higher education hits a serious roadblock with the Parliamentary Standing Committee studying the OBC Reservation Bill emphasising that the “creamy layer” should be kept out of the quotas.